Discover your real signals and capture more of their details with the industry's highest waveform capture capability. Automate setup, acquisition and analysis of high-speed serial data signals with a toolset engineered to deliver faster design debug and compliance testing. Industry-leading signal fidelity, minimum noise and highest effective number of bits (ENOB) provides confidence you are seeing your real signal and measuring it precisely. High signal-to-noise ratio and low internal noise floor enable you to perform precise characterization of your designs. From first power-on through operational checks, MSO/DPO70000 Series provides features you need to find problems fast. An industry-leading waveform capture rate and Pinpoint® triggering make you efficient at tracking down and capturing intermittent faults. Application support packages provide automated compliance testing, insightful debugging tools and the extensive signal connection options you need to verify and certify your latest design. Need a similar loaner instrument to use during repairs? Stay productive while your instruments are being repaired. The Gold Care service option offers a free loaner unit that will keep your team working. Loaner units are shipped within 48 hours of initiation of service and Gold Care customers receive priority status when instruments reach our service center. When you're debugging your next design, you need to quickly find and analyze a wide range of mixed-signal problems, from signal integrity issues like crosstalk or jitter, to bus faults such as setup and hold violations or dropped packets. 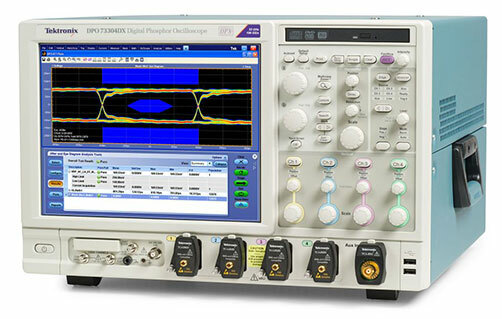 That's when you need an oscilloscope with powerful tools and reliable performance. You'll keep on schedule when you have an MSO/DPO70000 on your bench. Today's data communication networks are constantly evolving and are built upon many different standards. MSO/DPO70000 offers comprehensive, integrated tool sets for validating the physical layer of Ethernet devices and debugging ethernet-based systems from 10BASE-T up to 40/100GB. MSO/DPO70000 also offer advanced compliance and debug tools for other Data Comm standards. Next generation digital interface standards push the limits of today’s compliance and debug tools. 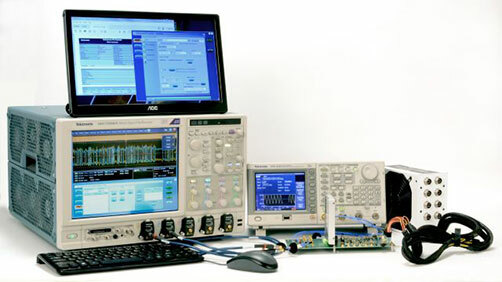 MSO/DPO70000 Series' automated measurement suites speed PHY validation cycles and ensure consistency. Powerful tools like Protocol Decoding and Visual Trigger shorten debugging when compliance measurements fail. Identify jitter and noise from crosstalk or other multi-lane noise coupling. MSO/DPO70000 Series with SignalVu Vector Analysis software gives you the analysis capabilities required to overcome the most challenging RF, wireless and microwave design problems with total confidence. 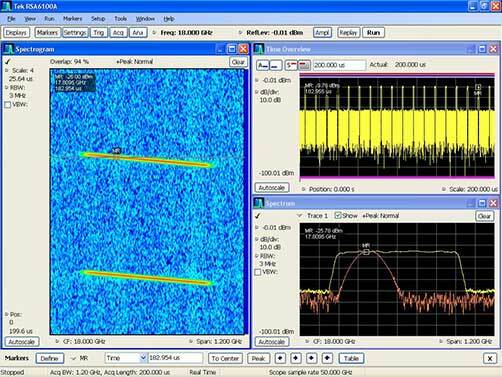 You can analyze signals up to 33GHz wide with the same tools used on Tektronix' Real-Time Spectrum Analyzers. 10GBASE-KR/KR4 Compliance and Debug Solution. BroadR-Reach/100BASE-T1 and 1000BASE-T1 Automated Compliance Solution. C-PHY TX Essentials solution provides easy way to debug and characterize C-PHY data links. C-PHY TX application allows you to select electrical and timing measurements, as defined in MIPI C-PHY v1.0 specification. Complete memory interface analysis package for DDR1/2/3/4, LPDDR1/2/3/4 and GDDR3/5. Option LP-DDR4 for LPDDR4 is available to use only on MSO/DPO70000 oscilloscopes. Simplifies identifying signal integrity concerns, jitter and their related sources and provides the highest sensitivity and accuracy available for real-time oscilloscopes. DisplayPort 1.2 Automated Conformance Test Solutions. 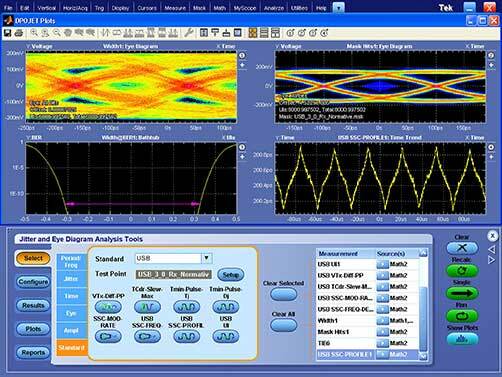 DPOQPI is a test automation software package that Tektronix has developed working in close partnership with the Intel engineers who own the QPI V1.1 specification and test procedures. The software simplifies user operation by presenting only the features required for PHY testing of the QPI V1.1 bus that maybe needed when designing and validating node controllers. Learn how to dramatically cut down test time on required compliance interop tests for USB3 using an automated test suite from Tektronix. Learn how to open closed eyes using equalization techniques and how to de-embed reflections and loss caused by the measurement setup using SDLA Visualizer for Tektronix Real-Time Oscilloscopes. 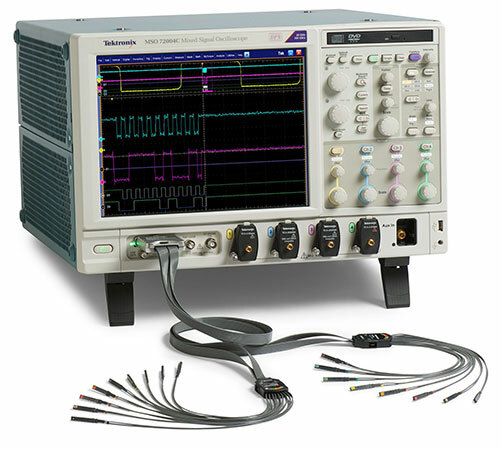 Tektronix oscilloscopes offer a portfolio of optional analysis capabilities to simplify serial bus debug or compliance verification. This selection matrix shows which serial standards are supported by each of the oscilloscope series.